This post is the first of an incisive, multi-part series, Beating the Heat, which I have written at the suggestion of a friend. Dressing in a hot weather is, literally, a black and white discussion. Black and white hide perspiration — sign of good health, blight on elegance — and thus are my mainstays in hot weather. 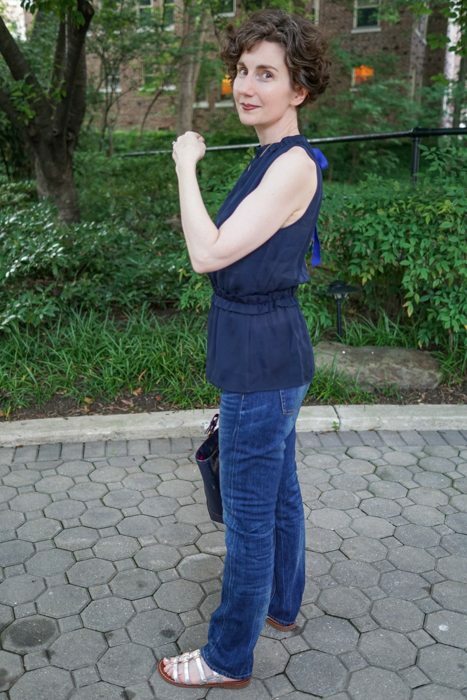 But I would be remiss if I failed to point out that navy blue serves almost as well as black. 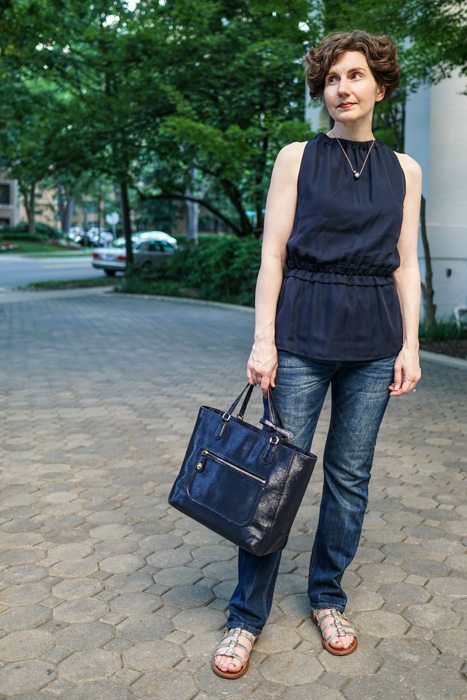 A silk chiffon top, jeans and sandals — passable for Casual Friday and then suitable for a movie or dinner out after work. International Klein Blue ties close the keyhole; very charming, no? An integral part of the strategy here is light jewelry, too. Metals and natural stone (like quartz) retain heat, so summer is a good time to turn to horn, wood, resins, and plastic jewels. This necklace is none of those things — it’s a fat pearl on a thin gold chain — but it weighs nothing. If I had a pair of off-white or bone colored huaraches (see below), I would wear them, but I don’t. 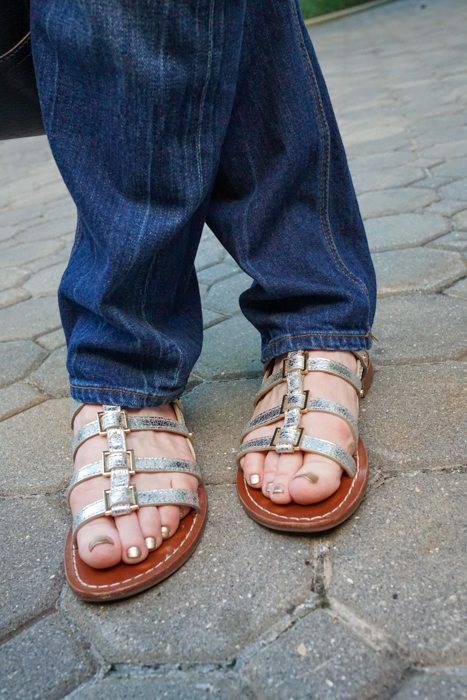 My silver sandals do very nicely, however. I thought about a jacket! Perhaps you’re wondering about whether my arms are too bare — for comfort or propriety. Generally at some point in the afternoon, the air-conditioning in my office becomes unbearable, so a jacket or wrap is a good idea. As you can see in this photo, tucked inside my bag is a white jacket made of a mid-weight cotton twill. I forgot to put it on for a photograph! My top tip for Beating the Heat is: Stay Out of the Heat. Jeans work for me in the summer if I don’t plan to be outside for long — long enough to walk to/from Metro or to grab lunch at work. But I wear my jeans loose; as readers have told me, my skinnies aren’t really skinnies. Gorgeous and elegant as always. A good look at the back of your haircut too. You have the most beautiful curly hair and just the short cut to set it off in a tousled way. Have you ever had it longer in recent years? I haven’t had long hair since I was in my early 20s and in my mid-twenties, it was a chin-length bob. Had I come of age in the era of messy chignons and clever layering, the story might be quite different. When I had long hair, you either wore it down or pulled back with barrettes or up in a rigid bun/up-do. I really like the way women currently wear long hair up — a loose/casual/messy (but not too messy) bun or chignon is lovely. 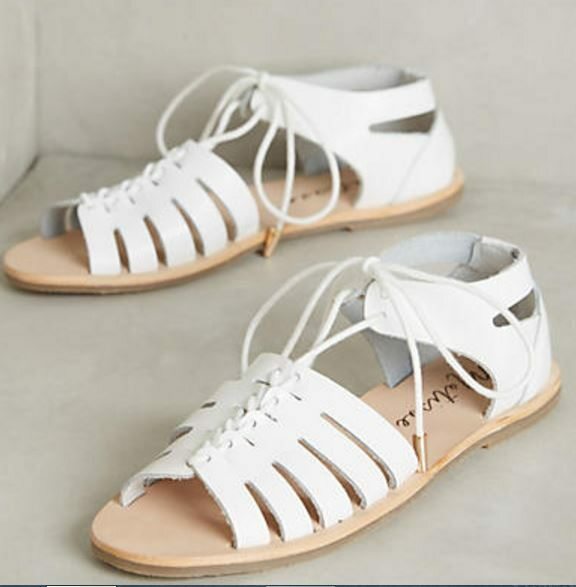 I think your Tory Burch Sandals are even a better choice than white. Again, you’re choosing slight transparency and no unsightly straps of a bra at your shoulders – you may need to do a segment on clever usage of appropriate undergarments! You’re a pro at this! 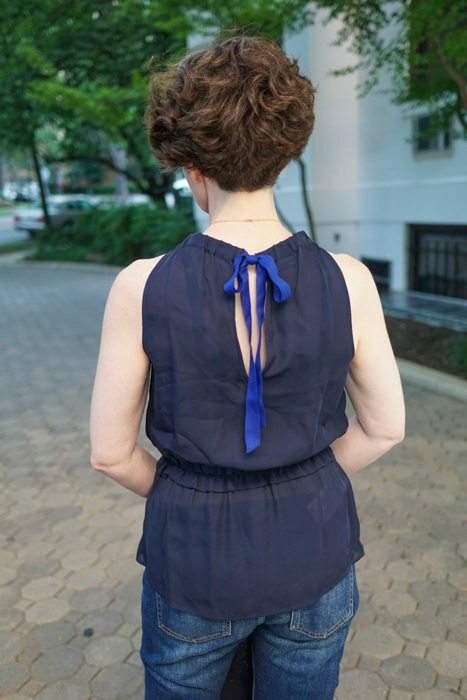 I had not realized until I saw these photos that only the front side of the blouse is lined. Sometimes these things are not apparent indoors, under artificial light. Odd manufacturing choice (why line the front and not the back? ), which almost makes me wonder if the top is defective . . . 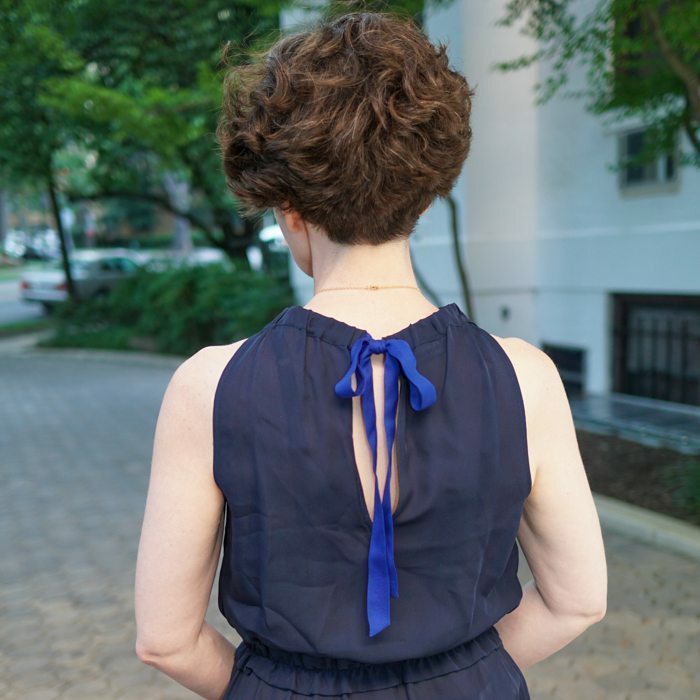 Anyway, I have since worn a navy camisole under it, and tucked the camisole straps under the straps of my bra, which is one of those convertible, Y-backed ones. This is a great look on you!! Love it. Absolutely love those cobalt ties on the navy blouse. I LOVE this blouse. I have to agree…your skinnies aren’t skinny on you! I happen to be wearing my very long hair in what I hope is a chic, albeit messy, up-do today if you want a photo. I do this all summer, maybe a “Beat the Heat” entry in the future is about summer hair? A great outfit. Navy blue is my very favourite colour. I admire the silver sandals and pearl on your necklace. 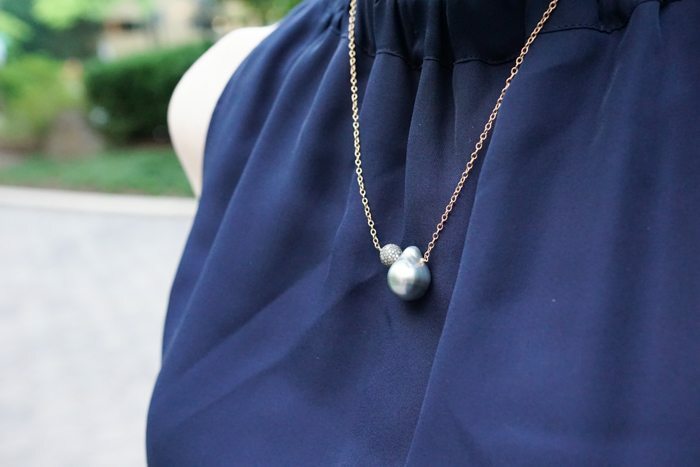 Love the silver/pearl as a prettier and lighter touch than grey, with your navy clothes. Would love to have seen the outfit with white jacket. Always want what cannot have! We don’t do the ‘jeans in the office on Fridays’ thing here in Australia ever. Sulking about that… And again!… You need an intern!! If only a 24 hour plane trip wasn’t an issue.